My first baseball broadcast on a radio station took place in the spring of 2007. I was a freshman at Northwestern University and very eager to get my three innings of play by play as the Wildcats took on the Michigan Wolverines. In fact, I was so fired up I got equally excited for a big Michigan play as I was for a big Northwestern play! This probably isn’t the best thing when you’re on the Northwestern student radio station. Lesson learned, and from then on I was very careful to make it clear who I was supporting as the local broadcaster without going overboard and saying things like “we” or “us.” After all, I am not on the team! As much as I would love to share those first three innings of my career, the audio archive is too distorted to justify posting. I’ve been all over the country in the pursuit of a major league baseball broadcasting career. I’ve been to Alaska (twice! ), Cape Cod, and Huntsville, Alabama. The most memorable game so far actually came during my first summer in Alaska when the AIA Fire took on the Kenai Peninsula Oilers in a must-win game on the second to last day of the season. The Fire needed to win to keep their championship hopes alive and in one of the craziest games ever, they did get that victory. But it took 17 innings. In Alaska the stadiums don’t have lights because the sun is out almost 24/7 in the summer. But this was late July, and Kenai does get dark that time of year. They start the games an hour earlier than usual to avoid that issue, but it didn’t matter as this one soon began to push the five-hour mark. The Fire scored four runs in the top of the 17th mainly because the Oilers could barely see as multiple errors were committed during the inning. Then the umpires did the unthinkable, they called the game on account of darkness and the Fire were declared the winners. The reason why the game could not continue the next day was that the Oilers had a 4 am flight to Kansas for the NBC World Series. I guess they could have reverted back to the end of the 16th inning, in which case the game would have been a tie, but for some reason they didn’t and the Fire won the next day to clinch the ABL Title. Crazy stuff. I did the entire game without commercials so needless to say that was a lot of talking! It was a great experience and the fact we all got championship rings after the Fire clinched the next day made it even sweeter in retrospect. 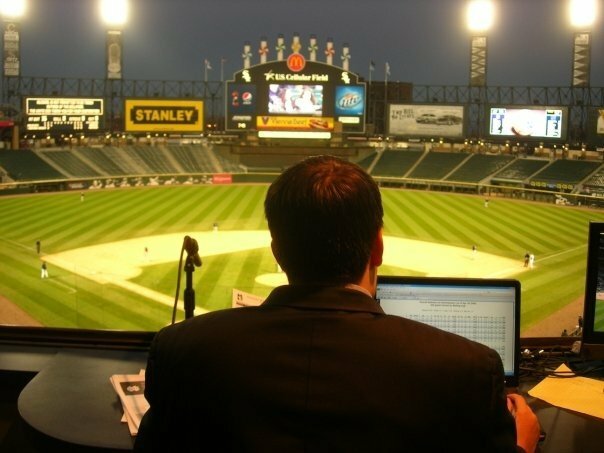 One of my most unique broadcasting experiences was when students at the Northwestern News Network were lucky enough to actually produce a live web stream of Northwestern-Notre Dame at US Cellular Field in 2009. I got to sit in Hawk Harrelson’s booth and call the game. The video below is an excerpt from that broadcast. I will continue to update this page with interesting stories and notes about baseball broadcasting as my career progresses..so stay tuned!